Exactly way more easier said than done. And even when I try to "let go"...it's hard for me to believe I'm actually "letting God". Probably your point here, huh? 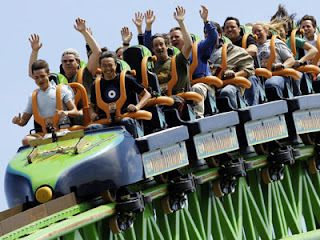 I'm a 'hands up, ride in the very front car' all the way kinda girl when on a roller coaster. Occasionally though, on a really fast or rough coaster, I will drop one arm to the hand bar for a split second to steady myself (as if that would keep me from flying out of the car - ha!). But in life, I often find myself griping the hand bar with all my might. White knuckled trying to control everything. I've been trying hard lately to 'let go and let God', but you are right, it is so hard. Maybe I need to remind myself that just like the roller coasters, it's much more fun with my hands up, but that if I need a moment to steady myself, He is there. He is at Mass, He is in His Word, He is in the Eucharist.